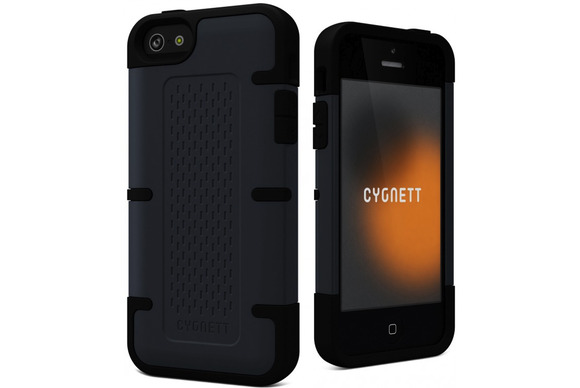 I was a big fan of Cygnett’s WorkMate case for the iPhone 4 and 4S ( ). I was thus unsurprisingly eager to get my hands on the WorkMate for iPhone 5, a $25 case from the company offered in black and slate grey, black and olive green (which the company calls “Khaki”), and all white. I reviewed the slate model, which looks terrific. The two-piece case combines a thick polycarbonate shell with an impact-resistant inner silicone layer. (You never need to take the pieces apart, not even when applying or removing the case.) Despite the firm material inside the case, the silicon edges leave it plenty flexible; putting the WorkMate on my iPhone 5 and removing it again presented no difficulty. The case uses press through button overlays atop the volume and Sleep/Wake controls. The volume overlays work well. The Sleep/Wake button overlay is merely fine: It works, but its indented shape makes depressing it a smidgen more effort than I’d prefer. The WorkMate uses cutouts around the rear camera and flash, mute switch, Lightning port, speakers, and headphone jack. As with Cygnett’s Bulldozer case ( ), the mute switch cutout on the WorkMate is roomy enough that I can toggle the switch without feeling like I need press-on nails. The case is slim and grippable. It feels good in hand, and when my iPhone 5 is clad in the case, it doesn’t slide around on tabletops. And because the case extends ever so slightly pass the iPhone’s screen, it should help cushion the impact if your iPhone falls butter-side down. The WorkMate ships with a microfiber cloth, an adhesive screen protector, and a small plastic applicator to help get that protector on the screen without air bubbles. I never use those screen protectors because they drive me crazy, but this one looks pretty standard. I like the slimness of the case, and—at least in the slate model—its understated looks. The WorkMate feels like a complimentary case to the iPhone, not one that tries to stand out visually or physically. I really like the WorkMate for iPhone 5; it’s a worthy successor to my beloved WorkMate for iPhone 4. I do wish the sleep/wake button were a little more responsive, but it’s a minor complaint. The case looks great and offers excellent protection.